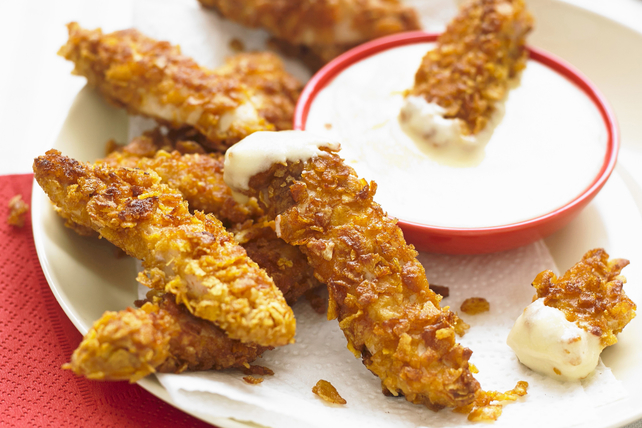 These Crunchy Chicken Strips with Creamy Jalapeno Cheese Dip are sure to please the kid in all of us! The creamy jalapeno cheese dipping sauce offers a nice contrast to the crunchy chicken strips. This easy recipe with only 4 ingredients is a perfect choice for busy weeknights. Bake 10 to 12 min. or until done. Microwave cream cheese product and milk in microwaveable bowl on HIGH 15 sec. ; stir until blended. Serve chicken as dippers with the cream cheese sauce. Prepare using Philadelphia Whipped BOLD Creamy Sriracha Cream Cheese Product or Philadelphia Whipped BOLD Cracked Pepper and Garlic Cream Cheese Product.